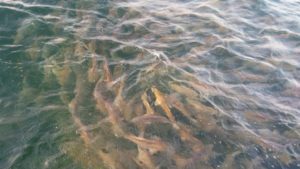 Inshore- The red tide effects are staying out of our local inshore waters for now, but its definitely on the doorstep of our area. Mostly to our south and scatter to our west and south west for the most part. This is allowing some great fishing around the pass and inside the pass to continue. However, we are getting tons of rain lately and that is making the pass water very brackish looking especially on the outbound tides. We are seeing lots of the live whitebait around still and that has the mangrove snapper fired up. The sheepshead are also starting to show up in force to gear up for their winter time spawn and winter aggregations around the docks and bridges of the area. The snook are still biting well inside Johns Pass especially when the tide is moving. Were also seeing a big late season push of tarpon through the pass lately as most mornings they are spotted rolling in the tide. Plus, as a bonus were seeing lots of tripletail in the pass and around the pass and along the markers heading out of the pass. Seems as though the brackish waters have really attracted them into the pass more than ever, one local angler, Eddie Trimmings even caught one while working a nekid ball jig along the bottom for pompano this past week. Near shore- The bait is still thick near shore lately and that’s holding the mackerel action steady. Yesterday the bait was a little further from the beach hanging right on the tide rips of the outbound brackish colored water leaving the pass on the backside of the outbound tide around 2-3 miles west of Johns Pass. Right along that color change line there were large schools of white bait getting worked by active mackerel. Were hoping to start seeing the kingfish anytime now as the water starts to cool down a little more and more. The hogfish bite is starting to improve ever so slightly as the recent rains have cooled down the nearshore waters a bit and seems to have turned on the hogfish bite a little for us near shore even more so than the consistent steady bite we see through summer. Were looking forward to the fall hogfish bite as the water cools the hogfish get more and more aggressive it seems. The deeper near shore waters were starting to see the red grouper cooperate for us more than they have through the summer but its still a fairly week near shore grouper bite. However, the gags will be moving closer to shore into the near shore waters in greater numbers as we approach the ‘winter’ time in Florida. 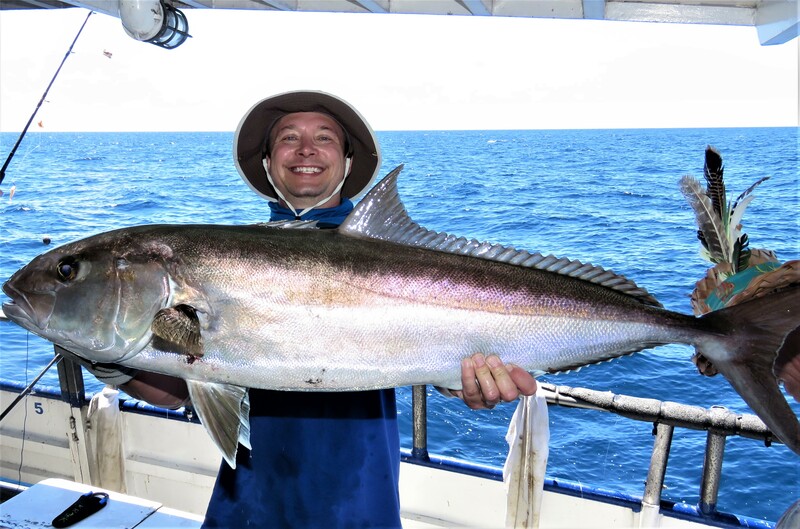 Offshore – We had a great 44 hour full moon trip this past weekend at Hubbard’s Marina that did very well on the amberjack and also had some great gag grouper action and mangrove snapper action through the night and red grouper pick through the day before finding an area where the jacks were thick. The gags have been biting best at night recently offshore. 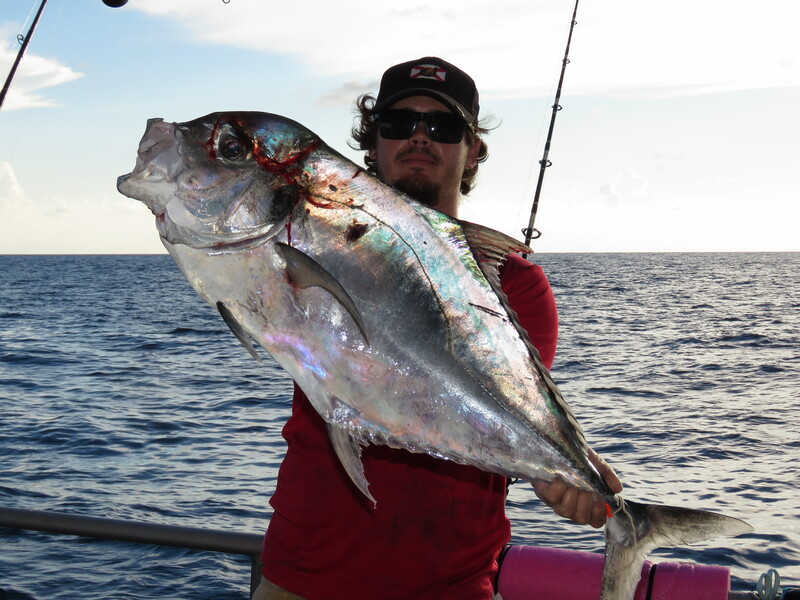 The jacks are biting best past 140 foot of water for the most part. Mangrove snapper biting best past 120 foot of water through the night, but these recent overcast days have had the mangrove bite going well during the day as well. The kingfish are around offshore past 120ft of water were seeing some nice scattered kingfish action mostly while bottom fishing these guys are cruising up our chum line to find some lucky angler’s baits. 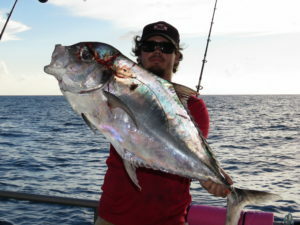 Tuna bite has been fairly week offshore as of late but were hoping to see them more consistently when the water cools off. The wahoo are around, but they are very deep right now past 160-170 foot of water for the most part. Red tide isn’t thick in our area, not even mild effects being felt right now, but we do have some very lightly scattered small dead bait fish around the back bays and a few along our beaches. Again, this isn’t a super thick choking kill everything red tide. It’s only very light or mild right now with very sporadic small amounts of dead fish around tidal rips where the wind and currents accumulate the dead small bait fish that are super susceptible to even the lightest red tide presence. However, due in part to the strong ride to our south I feel this has ‘pushed’ manatees up our way more and were spotting tons of them lately around Johns Pass and Upper Boca Ceiga bay. This has really been a unique sight to see manatees so frequently as of late. Were just hoping they don’t get caught in any more red tide but as long as they stay to its north side they will be fine. 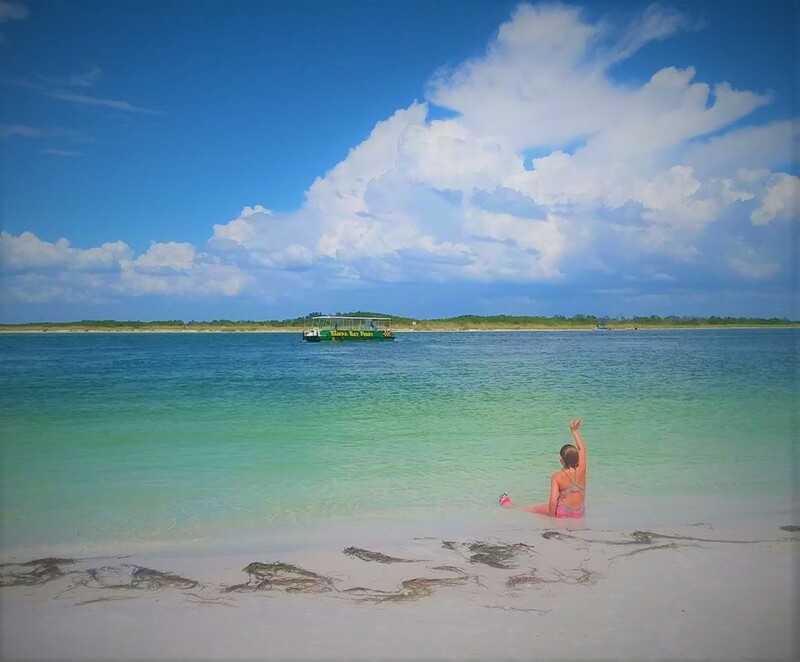 Along the same lines as the plentiful manatees we still have tons of playful dolphins around the area, and many are willing to come along the side of the boat to show off to our guests and play along side the ‘big blue boat’. The dry dock for the Florida fisherman is starting after labor day, during the dry dock period there’s plenty of 12 hour extreme trips with tons of room if you wanted to do some long range fishing to the 39 hour area while the 39 hour won’t be offered. 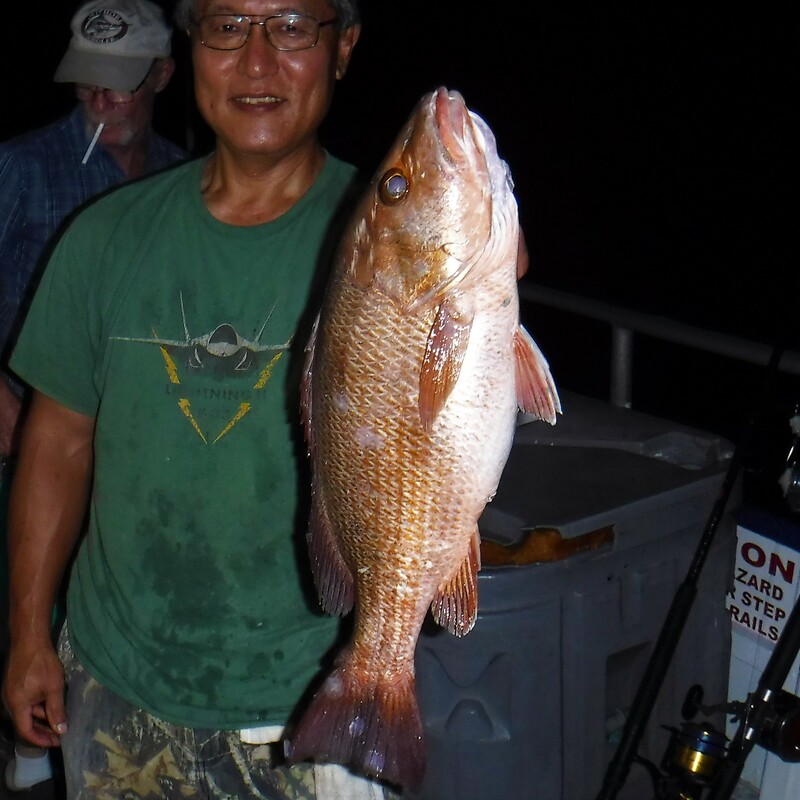 We will also have some 12 hour night mangrove snapper trips during the dry dock period as well to give you a shot at some mangrove snapper fishing while the 39 and 44 hour trips aren’t offered. Keep in mind the dry dock period is all about making the boat more nice and more safe for our long range overnight fishing guests.